The Western Front, Christmas, 1914. Out of the violence a silence, then a song. A German soldier steps into No Man’s Land singing “Stille Nacht.” Thus begins an extraordinary night of camaraderie, music and peace. A remarkable true story, told in the words and songs of the men who lived it. All Is Calm: The Christmas Truce of 1914 recounts an astounding moment in history when Allied and German soldiers laid down their arms to celebrate Christmas together, sharing food and drink, playing soccer, singing carols and burying each other’s dead. 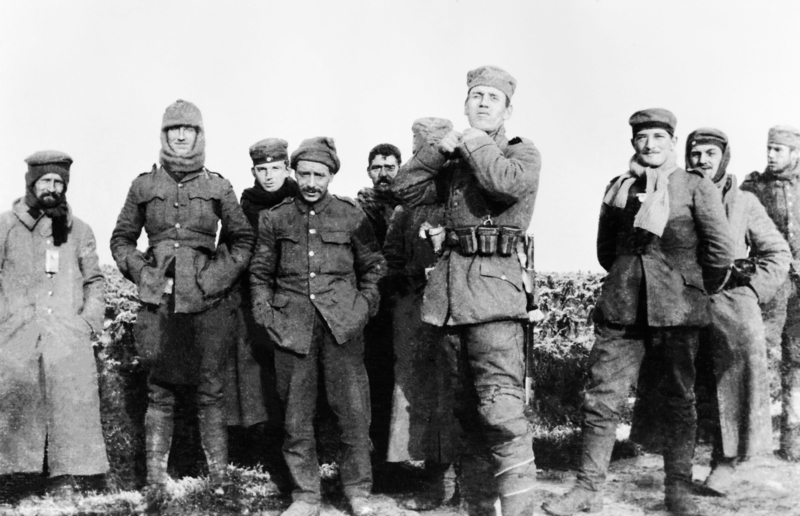 In some places along the Western Front the truce lasted a single night, and in others it endured until New Year’s Day. This dramatic re-telling weaves together firsthand accounts by 30 World War I soldiers with music including patriotic tunes, trench songs and Christmas carols. Out of the trenches of WWI, one of the most destructive episodes in our history, came a triumphant day of peace and camaraderie. But in the more than 100 years since, the myth surrounding the event has taken on a life of its own. Learn what really happened in December of 1914—and why the story of that Christmas has been retold for generations—in this deep-dive article from BBC. Click here. "The plangent tenors, lush baritones and rumbling basses are in excellent voice, and when they come together, the sensation is tremendous and the musical chill effect engulfing." Read why The New York Times finds the music of All Is Calm so "extroardinary" in its recent review here. "Rum is opened, cigarettes exchanged, letters from home read. The men wonder how this can happen, how they can be so close, and be expected to kill each other." In its recent review, The Daily Beast proclaims: "The superb All Is Calm leaves us mulling the terrible futility and cost of war, while crystallizing a moment of beatufiul humanity." Read the full review here. Read why TheatreMania's Zachary Stewart describes All Is Calm as "hands down, the most emotionally moving Christmas show I've ever seen." Read the full review here. Learn more about the cast and creators of All Is Calm here. Spotlight Talk with Pervis Sawoski starting at 3:15 PM. Learn more here. All Is Calm: The Christmas Truce of 1914 at The Broad Stage made possible in part by a generous gift from Linda & Michael Keston.